We hold hands a lot. Last night we stayed up late and made Valentine's for our children. 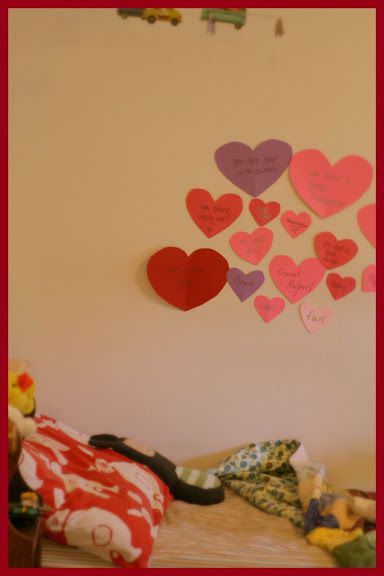 I cut out hearts and we wrote down good things about each of our kids and 'sneak attacked' their rooms with them. They woke up to messages of love. He got the plumber to come and fix the bathroom. He fixed the printer for me. He does not think of the 'whatifs' or the 'maybes' as I do. He holds me when the 'whatifs' overtake me, and tells me everything is good. 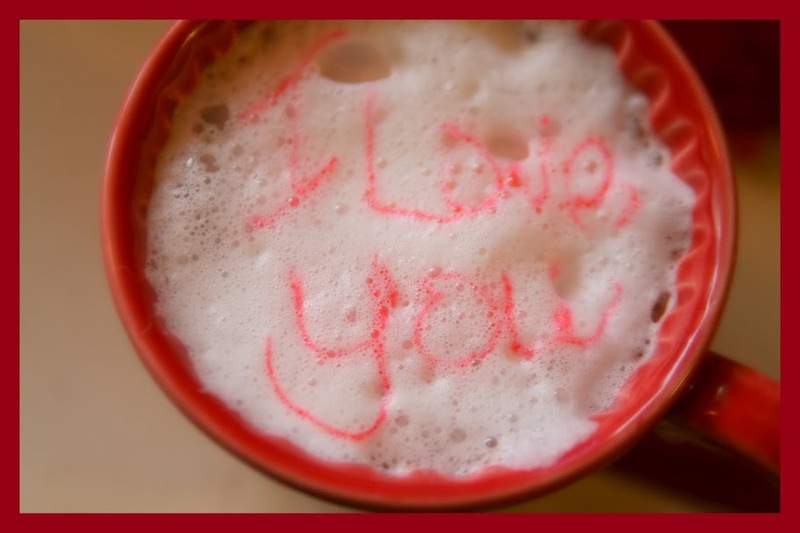 I make him good food, snuggle with him while watching movies, and write "I love you" in his cocoa. We are all here, loving each other. And so very grateful. Happy Valentine's Day my wonderfully supportive, understanding friends. Happy Valentine's Day! I'm sorry to hear about what you have been going through. Those heart swith notes are a good boost for everyone. Oh Val! I just read yesterday's post. How precious to be able to hold your husband's hand this Valentine's day! "Every good gift and every perfect gift is from above, and comes down from the Father of lights, with whom there is no variation or shadow of turning." Val, you are inspirational. As always. 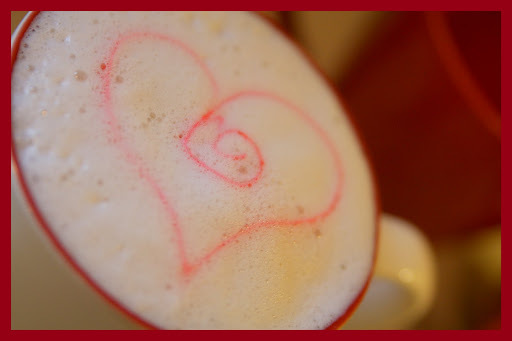 so sweet -- love the love notes in the kid's rooms and i want to write messages in hot cocoa too! i saw heart peeps at the grocery store on friday and thought of you and your kids having cocoa with heart marshmallows! : ) xoxo happy VAL day! Just did a quick wander and saw where your husband used to be a glass artist. It wasn't with BAGI by any chance? Love is a beautiful gift. You are truly blessed, Val. After reading your post, I did hug my hubby. May the universe wrap it's love around you and keep you all safe. Happy Valentine's Day. Enjoy some internet-time off! You family is always in our prayers! Although our eyes may never meet know that we are holding you up in prayer continually! my prayer for you this Valentine's is for peace to envelop your home and your family....to be blessed with love, happiness and serenity. I know that God wraps his arms around us when we need him.. and I'd say you need a God hug right now!! Prayers and thoughts go our to your and your family tonight! I hope you had a happy Valentine's day. Keep your chin up! You'll get through this, you're a tough, yet gentle cookie. Happy Valentine's Day! As difficult as this time may be, you may come to look upon it as changing the way you view life. Sometimes we rush through life and never appreciate the wonderful things we have - it seems you are taking the time to show that love - we can all learn from that. Thinking of you! Hang in there. Val, There is a Police wives only get together happening at the end of this month. You may have already heard about it. If not, email me and I can send you the info.